Best Washing Machine Solution For a B and B? Home > Problem Solving > Best Washing Machine Solution For a B and B? A bed and breakfast is going to get through a lot more washing than an ordinary domestic home, that's for certain, but does that necessarily mean that you need commercial washers and dryers to cope with it all? As with most things, it's a case of horses for courses; a small B&B can probably get away with consumer machines and the larger and busier the business gets, the more it makes sense to look at the commercial options. Operating a B&B means that you'll be washing more bed linen, towels and table linen than a domestic household so the problems are space, cost and time. For a small B&B consumer washing machines and dryers might be enough but it's worth having two washing machines at least. This isn't so that you can wash twice as much but so that there will be a washing machine free for you to do your domestic washing as well as the B&B washing. It also gives you spare so that if one breaks down you can continue to offer a good service to B&B customers, that's what will keep them loyal. Simply having two washing machines, and presumably a dryer as well, means that you will already be needing to have more space than an ordinary kitchen or utility room, so a large laundry room will be needed. Not only do you have to think about space for the appliances but also to air dry sheets, towels and table linen. With big loads of large items like these you will have a sky high bill if you rely solely on tumble dryers, particularly for the towels. The best option is an outside space that is open to the air but under a canopy. The canopy will protect sheets from rain to some extent but it's just as much about protecting the clean washing from bird muck and other dirt. A large indoor space like a garage will also work but it may need heating and must have through ventilation, otherwise the damp air will have nowhere to go. Of course at some times of the year things simply won't dry on lines no matter what setup you have so a tumble dryer of some kind will be required. The advantages of using commercial washing machines are that they can take greater loads, have faster wash cycles (sometimes as short as 30 minutes) and spin at higher speeds so that the laundry is dryer when it comes out. The downside is of course the cost, with entry level washing machines starting at something like five times the cost of good domestic ones. 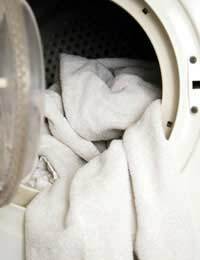 If you are running a B&B and the load on domestic machines is beginning to take its toll, it might be worth investing in a commercial washer to see if it really makes a difference. But it’s the dryers that may end up really delivering, particularly if you are in a very wet part of the country. You could dry three loads of domestic washing in one commercial tumble dryer so that would really speed up the whole process. Commercial dryers also benefit from features like water vapour sensors so they turn themselves off when they sense that the linen is dry. Ones that vent into the open air are a lot more efficient than those that condense the vapour and turn it back into water. Make sure you put the dryer in a place where you can get a duct from the machine to an outside wall if at all possible. Finally, if you are at all uncertain about this, you might well be able to find suppliers who will let you rent machines to see if it's really worthwhile. You may even be able to find a company who will offer a lease-to-buy scheme so that you can try the machines for say, a year. You can then return them or buy them once as you know how well they’ve worked out. Should I Extend My B&B to Add More Bedrooms? What If Your Neighbours Object to Your B and B? @Alison. We use a laundry service, it's an additional expense but it's well worth it. How do people cope with the huge amounts of ironing of bed linen, etc?Does anyone use an ironing press?